Clinton, Michigan – Vanilla EDENSOY & EDEN French Celtic Sea Salt are honored by Clean Eating magazine in their 2014 "Clean Choice Award" April feature. 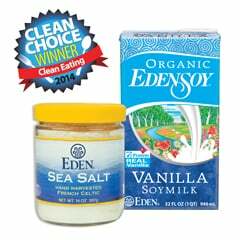 EDENSOY was named "cleanest" soymilk in the 'Dairy & Dairy-Free Alternatives' category, and EDEN Sea Salt in the 'Pantry Staples' category. All of the foods were rated for taste, texture, nutrition profile, convenience factor, and earth friendliness. Clean Eating said of Vanilla EDENSOY, "Finding a milk alternative is no easy feat - just ask the editors of Clean Eating! After years of searching high and low, we can easily say this is the cleanest one on the market. Try it steamed in coffee!" Of EDEN French Celtic Sea Salt they said, "A staple ingredient in any nutrition-savvy household, this high-quality, fine-grind sea salt is completely unrefined and rich in trace minerals - it just doesn't get any more pure than this!" EDENSOY is uniquely made. U.S.A. family organic whole soybeans and purified water are its base, and it is the only soymilk in the U.S.A. made with 100% real, pure vanilla extract. EDENSOY ranked number one of sixty-two brands in an extensively researched soy food report prepared by the independent research and advocacy group, Cornucopia Institute. See it at www.cornucopia.org/soy. EDEN Sea Salt is hand-harvested, stone ground sea salt from the protected Isle of Noirmoutier, Brittany, France created using solely centuries-old Celtic methods with no chemicals added. Smooth, mellow flavor with a wealth of trace minerals. Glass jar. Eden Foods is a 46 year, independent, principled natural food manufacturer offering more than 400 authentic, organic, traditional, pure foods. All are superb pantry fare. Information and over 1,100 free recipes are at www.edenfoods.com. We ask retailers, institutions, and co-ops to please visit us at access.edenfoods.com.